We created this Family Trip to Australia: Wildlife, Reef, and Sydney Package for a family from Cincinnati who were visiting Australia for the first time. They wanted to see local wildlife, the Great Barrier Reef, and iconic Sydney, and this trip gave them all the highlights with a unique twist! They started their trip in sunny Brisbane, the capital of Queensland, where they had a free day to explore the beautiful riverside parks and cafes. Then they visited Lone Pine Koala Sanctuary to see adorable koalas up close, hand-feed kangaroos, and get acquainted with the other countless species of Australian animals! After their wildlife encounter, they drove to their beautiful rainforest villa in Lamington National Park. Their Family Trip to Australia: Wildlife, Reef, and Sydney Package was filled with fun rainforest activities for the whole family: visiting a glowworm grotto in the evening, zooming through the trees on a flying fox, and enjoying guided nature walks, just to name a few. Next up, they visited Port Douglas—the gateway to the one and only Great Barrier Reef! They spent 3 nights at a gorgeous luxury resort located just steps away from the famous Four Mile Beach. They loved the enormous saltwater swimming pools and their spacious, stylish villa. While in Port Douglas, they snorkeled in the Great Barrier Reef and explored the ancient Daintree Rainforest with a private Aboriginal guide, who showed them traditional medicines, hunting techniques, and more. The kids loved the hands-on cultural experience, especially spear hunting for mud crabs. Continuing their Family Trip to Australia: Wildlife, Reef, and Sydney Package, they flew down to cosmopolitan Sydney. They had a fabulous hotel on the popular Bondi Beach, with easy access to the weekend Bondi Markets. The family enjoyed a fun beginner’s surfing lesson on Bondi Beach, and the rest of their time was free to explore Sydney at their leisure. This trip was a perfect family getaway, featuring Australia’s highlights, some quirky adventures, and plenty of free time to simply relax on the beach and spend quality time together. The kids didn’t want to leave, and mom and dad promised to come back to explore Australia again a few years down the road! Welcome to Australia! Fly into sunny Brisbane on Qantas Airways. Combine art and outdoor adventure in Queensland’s cosmopolitan capital, where creative spaces, music, and hip new restaurants meet pretty riverside gardens and man-made beaches. Enjoy a transfer from the airport to your centrally located, apartment-style hotel and explore Brisbane at your leisure today. Perhaps stroll through the gorgeous Roma Street Parklands, just a short walk from your hotel. Today, the whole family will have a chance to get up close to Australia’s most iconic animal, the koala! Enjoy a transfer to Lone Pine Koala Sanctuary, where you can see koalas, hand-feed kangaroos and lorikeets, and interact with 100 Australian animal species. Then, head back to the car for a short drive to Lamington National Park and your home for the next 2 nights, O’Reillys Rainforest Retreat. This beautiful hideaway is nestled among native rainforest, offering an immersive experience with nature. 2 activities per person are included in your stay. This evening, we recommend the glowworm grotto experience or the scenic sunset experience! Take your pick of activities today: guided rainforest walks, billy tea history tours, wildlife encounters, a birds of prey show, flying fox thrill rides, and much more are on offer! You’re sure to find something the whole family will enjoy. In the evening, relax in your spacious villa with a private terrace looking out into the rainforest. Enjoy a transfer back to Brisbane and a short flight to Cairns, gateway to the Great Barrier Reef! You will be picked up at the airport and ride to Port Douglas, where your beautiful beachfront resort awaits. 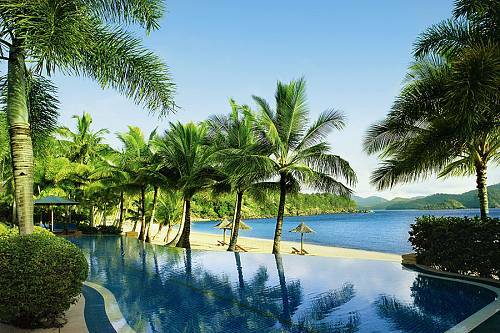 The Sheraton Grand Mirage Port Douglas is just steps away from the famous Four Mile Beach, is surrounded by lush tropical forest, and features seemingly endless saltwater lagoon pools. Catch a sunset on the beach this evening and relax in your gorgeous villa. Port Douglas is the only place in the world where 2 UNESCO World Heritage sites meet: the Great Barrier Reef and the ancient Daintree Rainforest. Today, you’ll explore the area on a private, full-day cultural tour with an Aboriginal guide, learning about the amazing relationships the Kuku Yalanji people still have with their land. Visit the majestic Daintree Rainforest and coastal habitats, learning about the traditional foods and medicines utilized from nature, sample some “bush tucker” cuisine, try traditional Aboriginal hunting practices, have a go at spear throwing, and if you’re lucky, catch a mud crab! To complete the adventure, cool off in a pristine freshwater stream. Today, it’s time to explore the one and only Great Barrier Reef! Explore the outer edge of the Barrier Reef, where special ribbon reefs run parallel to the Continental Shelf. These ribbon reefs are recognized as the most pristine ecosystems in the Great Barrier Reef. Clear water provides the best possible visibility, encourages rich coral growth, and supports spectacular marine life. You’ll have 5 hours at Agincourt Reef to enjoy unlimited snorkeling. The reef pontoon has a hydraulic platform for easy water access, change rooms and hot showers, expansive sundecks, air-conditioned lounge areas, a licensed bar, and the latest dive and snorkel equipment. Enjoy a transfer to the airport and fly to the beautiful city of Sydney today! Your hotel for the next 3 nights is ideally located on the famous Bondi Beach. The neighborhood’s trendiest restaurants, cafes, and bars are at your doorstep. The famous Bondi Markets are just a short stroll down the road, bursting with local fresh produce on Saturdays and one-of-a-kind designer finds on Sundays. Settle into your stylish, apartment-style room before heading out to see the sights. Make your way down to the beach today for a fun family adventure: surfing lessons! Join our mates at Let’s Go Surfing for an introductory surf lesson on Bondi Beach. You’ll learn to get safely up and onto your first wave without a worry and make memories to last a lifetime! The remainder of the day is yours to explore Sydney at your leisure. Perhaps take the scenic coastal walk from Bondi to Bronte Beach. It’s your last day in Sydney, so be sure to get all your sightseeing and shopping in today! Head to Circular Quay to see the iconic Sydney Opera House and Sydney Harbour Bridge, and explore the vibrant Barangaroo neighborhood nearby. If you really want to feel like a local in Sydney, you can enjoy a long lunch cruise on the harbour (additional cost) and take in the famous skyline from the sparkling blue water! Say goodbye to Australia today as you enjoy a transfer to Sydney airport. Fly back home, reminiscing about all the fun adventures you had as a family down under!